Price is for 50 of these beautiful large 10mm beads - ready for stringing. Color is a light-geen white. 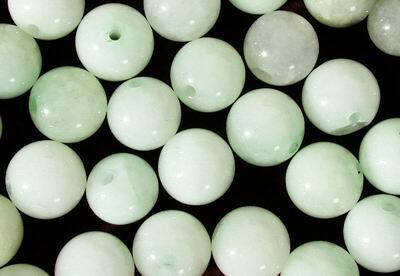 The most famous type of jade carved in China is from Burma, with shades of green, lavender, yellow, white and grey. These colors form over millions of years from minerals in the rock. Every piece of jade has a secret meaning. Discovering that meaning and the legends behind it is a very satisfying for those who practice this dying art.